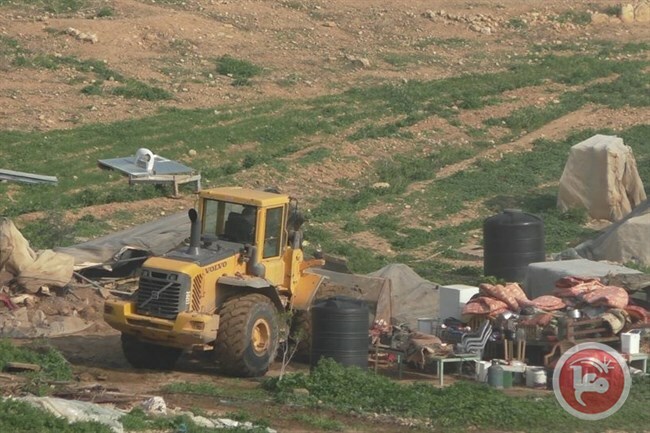 TUBAS (Ma’an) — Israeli forces on Thursday destroyed over 40 Palestinian homes and structures in the Tubas district of the occupied West Bank as ongoing Israeli policies in the Jordan Valley continue to drive Palestinians out of their homes. A spokesperson for Israel’s Coordination of Government Activities in the Territories (COGAT) did not have immediate information on the demolitions. Threats of displacement for the thousands of Palestinian Bedouins living in the Jordan Valley in particular have reportedly increased dramatically since 2012. Rights groups argue that Israel aims to fully annex the strategic area of land and is unlikely to return the occupied area to Palestinians. Palestinians are frequently ordered to evacuate their villages during military trainings, and B’Tselem reported that military exercises carried out last month caused severe damage to crops belonging to Palestinian communities.